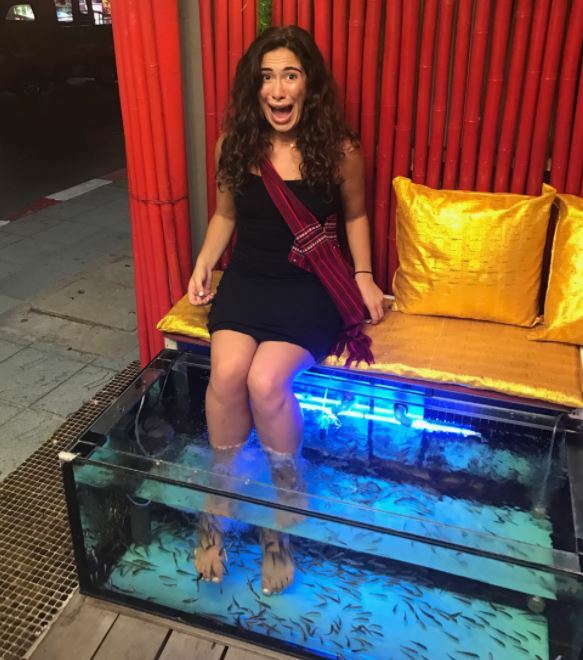 Getting a pedicure in a tub with fish has been a craze around the world. Pedicures entail applying nail color to your toenails and removing dead skin. The result is smooth feet free of calluses. The standard procedure of removing calluses and dead skin on your heels and bottom of feet is done using a metal foot file or a pumice stone. However, some spas have resorted to using fish to provide what is called fish pedicure services. How much does a fish pedicure cost? Where are the spas located? This type of spa pedicure is prepared by putting Gerra rufa fish in a tub. Other names include doctor fish, nibble fish, or Kangal fish. A client puts their feet in it. The fish then nibble dead skin off the feet – a procedure usually done using a pumice stone. Garra rufa fish originate from Turkey, Iran, Syria and Iraq. As fish pedicures became increasingly popular in the recent past, people started overharvesting this specific type of fish. The Turkish government has put in place measures to ensure that doctor fish are not overharvested and exported. In the various states in the United States of America, fish pedicures have been banned. With all the bans going on, it is highly unlikely that you will find a legal spa with this service near you. These pedicures are believed to have healing abilities. Some with fungal infections, psoriasis and eczema on their feet believe taking a foot bath in such tanks can help heal these conditions. In general, here are the benefits of a fish spa to your feet. The service helps get rid of excessive dead skin black spots and rough feet. The tickling effect you feel when the animals nibble on your feet improves blood circulation in your legs. Giggling makes you relax and relieve stress. A Garra rufa pedicure helps stimulate the skin for the growth of new cells. You will be left with glowing skin on your legs. Some of these advantages are not scientifically proven though. For example, your psoriasis may improve but may not get cured through spa therapy. At the spa, the exfoliation tub is prepared by cleaning and sanitizing it. Each customer’s tub is then filled with clean water and about 150 fish. The client is then made to put their feet in the water. The fish then start to nibble dead skin off the legs and feet. The reason behind this is that Garra rufa are believed to feed on dead scales off other fish in the sea. They such rather than bite off since they have no teeth. The process may last between 15 minutes to 1 hour depending on the amount of dead skin on your feet. In some instances, the spa therapist may repeat the procedure to ensure all the calluses are removed and the client is left with a soft skin. Precautions are always taken to prevent infections. Your feet may be inspected for cuts and wounds. The legs are then cleansed thoroughly to remove any dirt. In most places, each spa contains its own clean water that gets refreshed. As soon as you dip your feet inside the tub or tank, expect them to start nibbling. You will feel ticklish. This feeling does not turn into an unpleasant one. Instead, it becomes relaxing as the fish pedicure goes on. As soon as the treatment ends, your spa attendant will clean and rinse off your feet. The other regular steps of a pedicure will then follow. Does the pedicure hurt? Since the animals have no teeth, they are merely sucking and nibbling off dead cells from your skin. The experience is only ticklish and tingly, but nothing that is painful or hurts. If you bleed, then probably the kind of fish used is not the right one. Also, practice safety by ensuring you don’t have cuts and wounds on your legs and feet before visiting the spa. The cost of a fish spa pedicure ranges from $45 to $120. This depends on the length of the therapy as well as other additional services you may be interested in. A typical 20 to 30-minute pedicure may be charged about $45. However, this may not be enough for the best results. Most spas will recommend you do it for longer or coming back for regular treatments for the best results. The amount you will pay may eventually depend on what other services you may have requested. Foe example, shaping your toenails as well as applying polish can make the cost go higher than the estimates given above. How does a pedicure in a fish spa compare to a traditional pedicure? Most traditional spas use a loofah or a pumice stone to exfoliate feet and get rid of dead skin. Your feet are then massaged with warm oil and a moisturizing lotion applied. Sometimes, your toenails get shaped and polish applied. However, when it comes to a pedicure done by fish, the initial part of the service differs greatly from the traditional one. For a fish pedicure the before and after feeling may be the same as your usual foot therapy. However, the initial stage differs. Instead of a pumice stone sloughing off your calluses, fish nibble it off to give you soft feet with exposed new skin. Although this service is popular, there are some dangers and cons that come with it. In October 2008, for example, fish pedicures were banned in Washington. The Washington DC Department of Licensing remarked that they did not feel the service hygienic enough. With that in mind, what side effects can you expect from fish salons when things go wrong? Fish themselves cannot be adequately sanitized or disinfected between customers. This means that you can easily contract a disease even if the water is changed. According to sources like Peta, the Garra rufa fish have been found to carry “strains of several infection-causing bacteria, including Streptococcus agalactiae.” Therefore, clients are at risk of contracting pneumonia and other bacterial infections. Since the fish excrete or produce waste, the foot tubs used for the pedicures are a fertile breeding ground for bacteria. Any small cuts, wounds and sores on your feet are at a risk of infection when you immerse your legs into the spa tubs. Other than these risks, there are further arguments discouraging the use of fish in salons and spas. There are concerns of animal cruelty. It is believed that the fish must be starved first for them to feed on the dead skin cells. There are cases of Chinese Chinchin fish being confused with Garra rufa. The Chinchin species grows teeth with time and can bite, causing injuries and bleeding. A Google search can help you get the service near you. You have to search with your city in order to get spa listings with reviews of the service. Other than that, we found a Doctor Fish Massage website listing where you can find sites across the United States where you can go for the service.